Are you tired of shovelling snow yet? How about scraping ice in the recent warmer temperatures? We understand that it’s important to keep your sidewalks clean (and we don’t want you to get fined by the City), but we also want to make sure you’re shovelling in a way that doesn’t lead to injury. One of the most common muscles involved in low back strain is the quadratus lumborum (QL). This short, deep muscle, is actually the deepest abdominal muscle in your body; despite being known as a back muscle. It begins at the top of the hip and extends to attach into the lowest rib. It helps extend the back, elevate your hip, and help with breathing. The QL does not rotate and is most easily strained through twisting your spine. A strained QL can cause pain locally, into the sacroiliac (SI) joint, through the glutes and/or into the abdominals. Avoid injury with some side bends, shoulder rolls, light squats and general movement helps the body prepare to work. 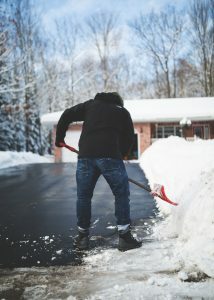 Make sure the shovel you’re using is the right weight and length for you, otherwise your body and muscles will start overcompensating in ways that can lead to pain and strain. Everyone says it: lift with your legs, not your back! We cannot emphasize enough how important this is. Drive the force through your heels and into your hips rather than straightening your lower back. Twisting your body is the most common way to strain the QL. Avoid twisting your body with a heavy load of snow. Instead, push the show and offload it in a forward motion. Allow your body to rest and take stretch breaks in between, making sure you change up which side you’re shovelling with to help balance the muscle load. What do you do if you think you’ve strained your QL? Make sure that it is a muscular issues and not anything more serious. This flushes the inflamed tissue and can help reduce pain and soreness. Make sure your range or motion is pain-free, but if you stop moving altogether this could lead to excessive muscle guarding and stiffness. Book a massage or acupuncture appointment! These complementary therapies can reduce pain, increase range of motion quickly and help you get back to your daily activities.